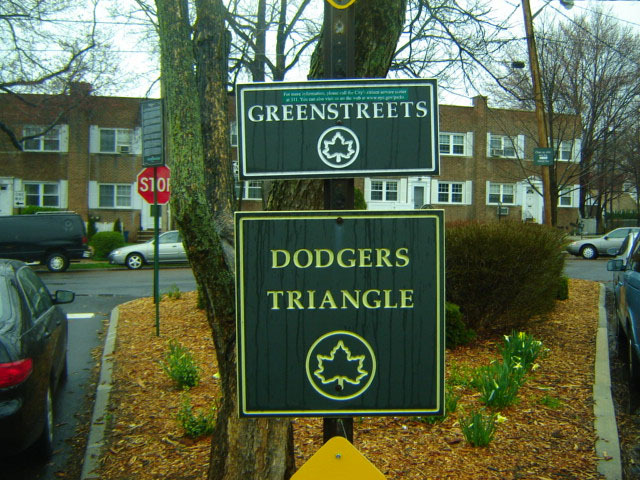 This triangle honors the beloved Brooklyn Dodgers baseball team, the only major league team ever named for a borough instead of a city or state. The Dodgers moved to Los Angeles in 1957, but they are warmly remembered as a symbol of community and bygone days. The Brooklyn team joined the National League in 1890 under the management of William “Gunner” McGunnigle. Originally christened the “Trolley Dodgers,” the name was soon shortened to just “Dodgers,” but the myriad of nicknames attached to the team were anything but plain. With seven team members newly married in 1888, new fans dubbed their heroes “the Bridegrooms.” In their time, the Dodgers were also popularly known as “Ward’s Wonders,” “Superbas,” “Robins,” “Daffiness Boys,” “Flock,” and “de Bums.” In their rookie year the Dodgers won the championship with an 86-43 record. The Dodgers began their career in Washington Park, but as the club grew in popularity, owner Charles Ebbets decided to move his team to a brand-new park in Flatbush. Construction began at “Ebbets Field” on March 4, 1912, and the new field was officially dedicated on April 9, 1913. Ebbets died on April 18, 1925, at age 66. The scheduled Dodger-Giant game to be played that day went on as planned. Everyone knew that Ebbets himself would consider his death as no good reason to cancel a ball game. The Brooklyn Dodgers made history in April 1947 when they signed Jackie Robinson (1919-1972), the first black Major League baseball player. Other well-known Dodgers included Duke Snider, Pee Wee Reese (1918-1999), Roy Campanella (1921-1993), and others. The pigeon-toed Robinson won the first Rookie of the Year award, but it was 8 more years before de Bums finally managed to beat their greatest rivals, the Yankees, in the 1955 World Series. Two years later, with the profits waning, the club closed Ebbets Field forever and owner Walter O’Malley (1903-1979) moved his franchise to Los Angeles. The team’s last game as the Brooklyn Dodgers was on September 24, 1957. This triangle was first named for the Dodger who batted in the very last run in the last game at Ebbets Field, homerun legend Gil Hodges(1924-1972). Gilbert Raymond Hodges began his Major League career in 1943. In addition to his stint with the Dodgers, the Princeton, Indiana, native played on or managed six other pennant-winning teams in his career, most notably the New York Mets. Hodges smacked the first home run in the history of that team in 1962. In 1962, the Mets wanted to trade Hodges to the struggling Washington Senators. Rather than be traded, Hodges retired as a baseball player, but ironically, he agreed to manage the Senators. He did improve the team, but he could not get the Senators to win a title. In 1968, the Senators traded him back to the Mets where his management skills were so impressive that the dragging expansion team of the mid-sixties became the World Champion “Miracle Mets.” When Hodges died, the Mets retired number 14 in honor of his stellar skills on and off the field. Hodges remains one of the few Mets whose number was retired. This triangle is bounded by Dongan Avenue and Hodges Place, however, the thoroughfare gets its name from one of the many Hodge or Hodges families from Staten Island. In fact, this was not the first street on Staten Island named for a Hodges. The former Stark Court in West Brighton, which originally bore the name Cedar Place and has since been eliminated, was renamed Hodges Place in 1915, and then received its final name in 1930. Just a year later, the adjacent thoroughfare, which at the time was called Cedar Place, received the name Hodges Place. Drawn out in 1940, this little property was first landscaped in the late 1940s. It now contains a tree and two shrubs.